The Accounting Today Accountants Confidence Index ACI 2013 maintained a positive trajectory from May-June, with anticipations of short and mid-term growth. The ACI, created in partnership with outsource payroll giant ADP, is an economic evaluation, adjusted every 30 days, that conflates the insights of CPAs polled into the strength and prospects of businesses in the U.S. 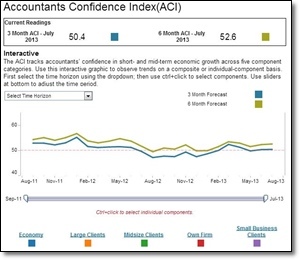 Created from a monthly poll of the Accounting Today Executive Research Council, The Accountants Confidence Index ACI 2013 is updated monthly.